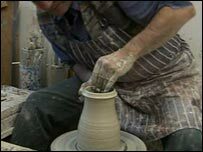 The Leach Pottery in Cornwall has officially re-opened after undergoing a £1.7m facelift. Bernard Leach set up his pottery in St Ives in 1920 which helped to establish Britain's ceramic art worldwide. The studios, under the guidance of Jack Doherty, chairman of the Craft Potters Association of Great Britain, will help train young potters. The European Regional Development Fund awarded £500,000 towards the restoration work. Other money towards the cost of the work came from the Heritage Lottery Fund, the Arts Council, Cornwall County Council and Penwith District Council. Bernard Leach was born in 1899 in Hong Kong. He spent many years in Japan before his work made him internationally famous because of its oriental style. He became a leading pioneer of hand-made pottery at a time when England knew only industrial methods. He died in 1979.